Tourism in Portugal is at its highest year yet, with over 12.7 million visitors recorded in 2017. It’s such a hot travel destination that AESU has added a Portugal Adventure tour to its upcoming list of exciting trips! So why is everyone flocking to Portugal? Discover several reasons to visit this unique and beautiful country. Portugal is home to one of the sweetest, richest custard tarts in the world, also known as pasteis de natas. Only five people in the entire globe know the recipe for the flaky, irresistible egg-cream tarts, so foodies are instructed to head to Lisbon to enjoy a bite at the Pasteis de Belem. With over 100 beaches, visitors can spend their entire trip basking in the sun and gazing off into the Atlantic Ocean. Experience true postcard views at the Algarve, considered one of the biggest and most important tourist attractions in Portugal. Enjoy a day of surfing or paddle boarding, then dine at one of six Michelin-starred restaurants in the region. Portugal is one of the oldest countries in Europe, and many of its castles have been well-preserved throughout the years. The Castle of the Moors is one of the oldest remaining fortresses in the country, as it was built during the eighth and ninth centuries. If you’re a thrill-seeker, Portugal is the destination for you! Spend the day seeing the countryside from above, and enjoy one of the many ziplines and aerial adventure parks that Portugal has to offer. Tour the countryside on horseback, hike the lush landscapes on foot, or paddle your way through the remote grottoes of the Algarve. Endless adventures await! 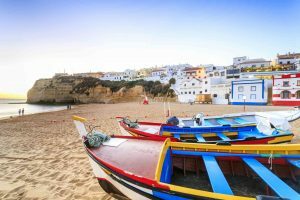 Portugal was recently declared the second best value destination for a European vacation, right after Bulgaria. Portugal is the traveler’s paradise, as it offers the beauty of Western Europe for lower prices than most! Back in the 1990s, JK Rowling taught English in Porto, the second largest city in Portugal. She was a regular at the Livraria Lello Bookstore, and the lavish, magical interior said to have inspired the Hogwarts Library. This entry was posted on Wednesday, April 18th, 2018	at 10:00 am	. You can follow any responses to this entry through the RSS 2.0	feed. Both comments and pings are currently closed.